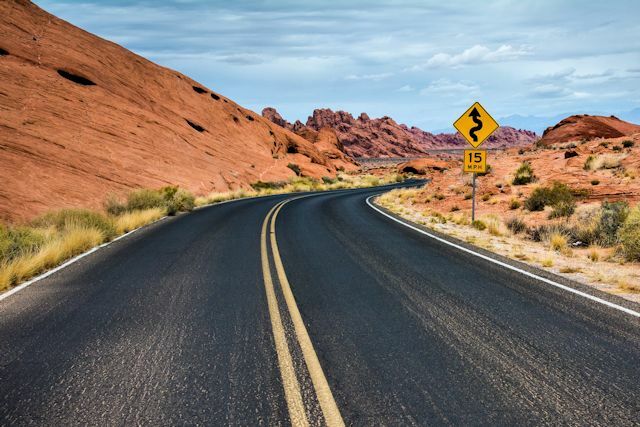 For some people, genealogy is a fascinating hobby, a treasure hunt for long-lost family members and the unravelling of threads leading to unknown ancestors. Others just don't appreciate the thrill of this particular kind of hunting. Generally, we're in the latter group. 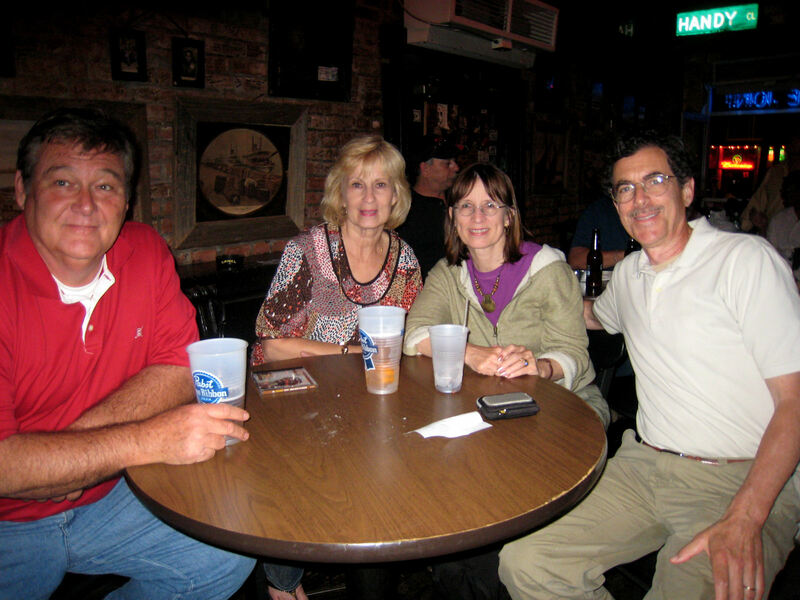 But when Dianne and her sister cooked up a "roots and blues" tour to western Tennessee, we were on board. We met up at Jeanne and Don's home in west Alabama and the four of us headed for our first stop-- Memphis (the blues part of the trip). Obviously we couldn't go to Memphis without at least a drive-by past Graceland. 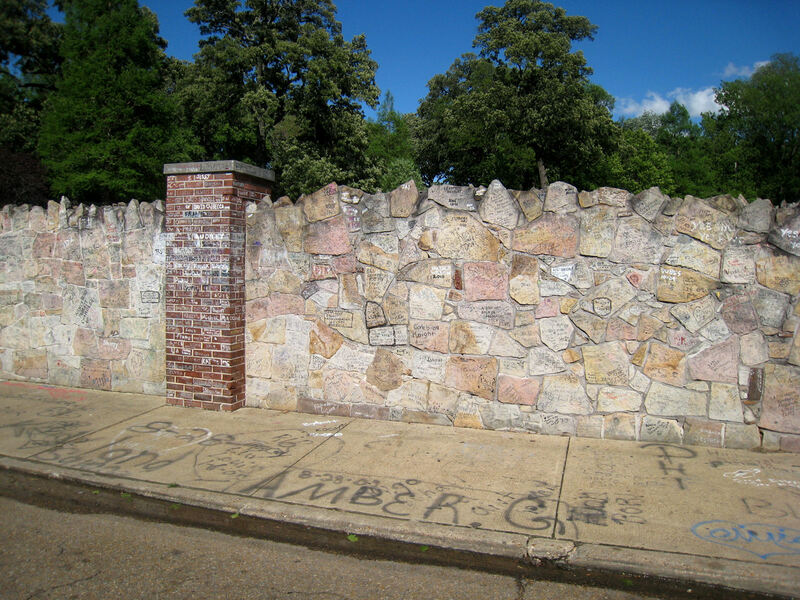 Elvis's legendary home is bordered along the street (Elvis Presley Boulevard, of course) by a long fieldstone wall, every inch of which is covered by graffiti. Another Memphis tradition on our radar was the Peabody Hotel's March of the Ducks. Admittedly, the sisters were a bit more enthusiastic about this show than the guys but they went along patiently. 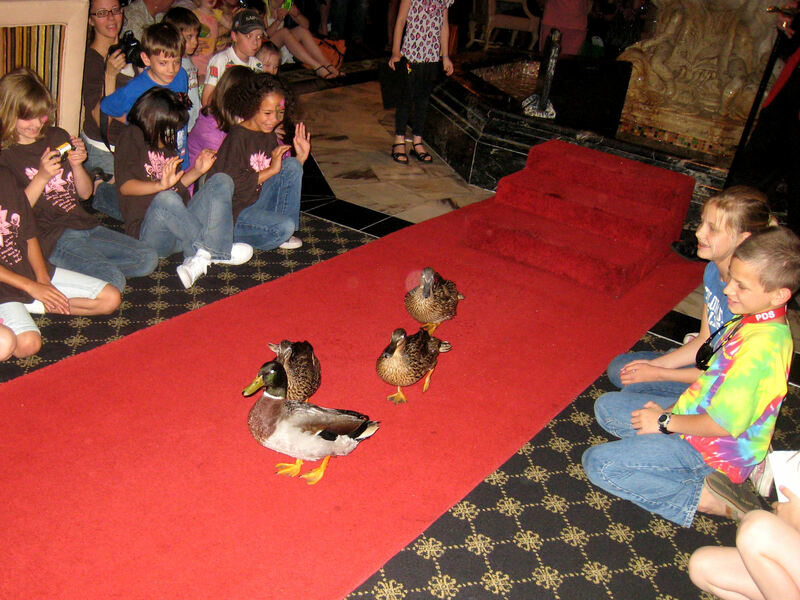 The duck march custom at the Peabody dates back to the 1930s, when the hotel's manager and some friends had just returned from a weekend hunting trip in Arkansas. They thought it would be amusing to leave their live decoy ducks in the hotel fountain and watch the reactions of hotel guests. The guests loved the idea, and since then, ducks have played in the fountain every day. They march to the fountain daily at 11 a.m. and march from the fountain into the elevator at 5 p.m. When not on duty in the lobby, the ducks live in their Royal Duck Palace on the hotel's rooftop. Knowing that Memphis is famous for its barbecue, we asked everyone who might know, "What's the best place to get barbecue in Memphis?" The reply was universal: Rendezvous! 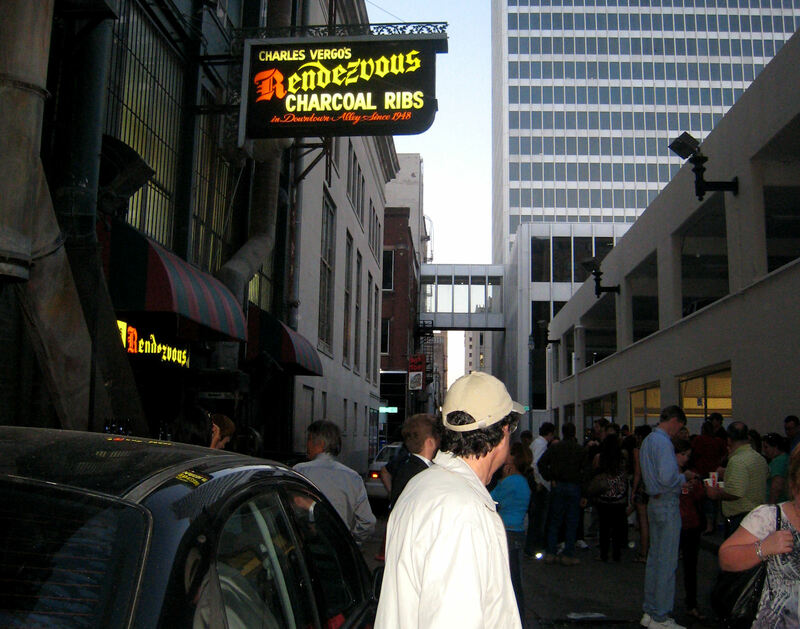 Opened in a basement on an alley in 1948, this legendary Memphis eatery reportedly serves their famous dry ribs to several thousand people on an average Saturday night. 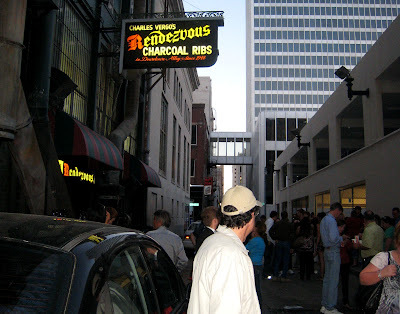 As we rounded the corner a little past 7 on this Saturday night, we found the alley jammed with hungry rib eaters waiting to get in. When we wound our way to the hostess stand, we were told the wait for a table would be about an hour. The 'cue was reported to be good, but was it worth that long a wait? Pulling out our "full restaurant back-up plan," we asked if there was a bar (yes) and whether meals were served at the bar (yes!). Heading downstairs to the bar area, we found four seats within seconds and were soon ordering our meals. After an amazingly delicious meal at Rendezvous (they even had a vegetarian barbecue dish! 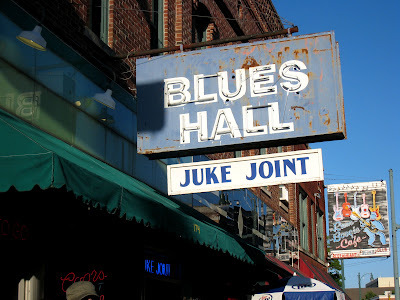 ), we walked over to the famed Beale Street to seek out some Memphis-style blues. Our first stop was B.B. King's Blues Club. Who would know more about the blues, right? But B.B. wasn't in the house (he also has locations in Vegas, Orlando, Nashville, NYC, and West Palm). It was our assessment that the band that was playing at B.B. 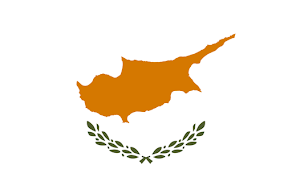 's had never even heard any blues; they were playing rock and playing it loud and hard. So we moved on down Beale Street and were drawn into the Blues Hall Juke Joint. 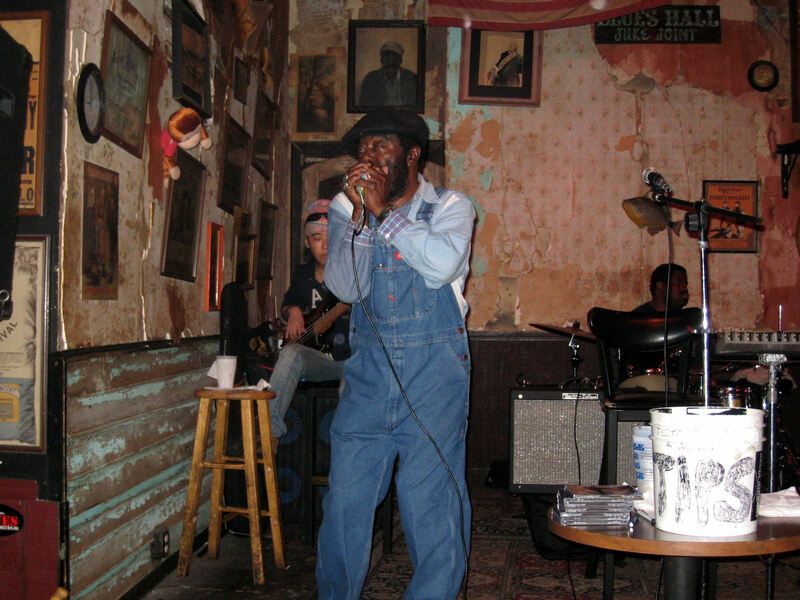 In the Blues Hall, we found Robert "Dr. Feelgood" Potts and his band serving up some of the Memphis-style blues that originated in the Mississippi Delta where Potts was born and raised, as he sang in his Greenwood Mississippi Town. Dr. Feelgood is a long-time Memphis performer and, like most local artists, doesn't get paid much for playing sets in Memphis clubs, so on breaks he was selling copies of his latest CD. He also had a hilarious and very effective song called Tip the Band, which ended each set. 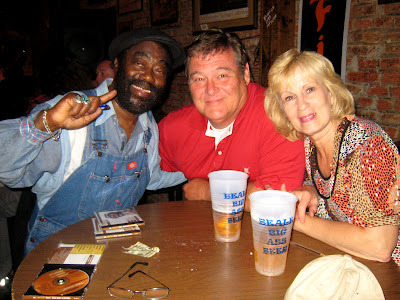 And he was just what we were hoping to find on Beale Street-- real local blues, a great live performer, and someone who appreciates his fans, old and new, often giving shout-outs to audience members by their hometowns. Between sets he was constantly visiting with club patrons. With his masterful harmonica and his original songs, Dr. Feelgood kept us entertained until closing time, something we seniors don't see very often. Both couples left with a copy of his CD, Going Down to Memphis. We had already heard and loved most of the tracks. The blues leg of our Roots and Blues Tour was everything we had hoped for-- scrumptious barbecue and authentic Memphis blues. And here's a little taste of Dr. Feelgood's music just for you.